Have you ever grimaced at the sight of uninformed snorkelers, swimmers, or divers standing on coral reefs and wondered in exasperation why more beach parks and hotels do not prominently display signs about human caused damage to coral reefs? Have you ever felt dismayed at the sight of ocean-borne and non-ocean-borne trash littering the beach and wondered why there wasn't more of an effort by our beachgoers to remove at least a few pieces of garbage every time they leave the beach? Have you ever wondered if there are more ways in which you could be involved in efforts to protect our ocean and our beaches? 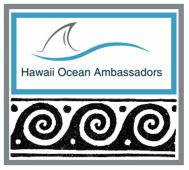 Rather than spend time in the near-term navigating through the legal hurdles of setting up a non-profit, foundation, or other organization, Hawaii Ocean Ambassadors intends to be a self-funded, loose network of friends and neighbors centered around a mutual passion for protecting the beauty, health, and life of our oceans and to better avail ourselves of the various channels already available to us but so often overlooked - our voices, our hands, our energies, our minds, our ideas, our votes, and our behaviors. We are citizens, people who love the ocean and our beaches, and are interested in preserving our fragile ocean ecosystems in every way reasonably available to us. 1. Host informal beach clean-ups and invite as many friends and neighbors as possible and share the joys of volunteering, meeting new friends, and helping to protect and even improve this special place. 2. Create and post sample letters that can be copied by our Ambassadors and sent to hotels, tour companies, airlines, and our representatives in government requesting more targeted and effective steps be taken to better educate both visitors and locals alike about protecting and even improving our local environment. 3. To attempt to harness and utilize social media to provide efficient avenues to communicate ideas, post and share volunteer opportunities, and in hopes of better educating our readers on ocean related topics. 4. To leverage social media 'likes' and 'shares' to pressure hotels, tour companies, airlines and government officials to take action on specifically targeted issues and requests. We hope above all that we are able to encourage others to want to participate in their community, to better understand our ocean and beach environment, and to also perhaps find new ways of communicating their ideas and wishes regarding public - and private - policy as it relates to our oceans and beaches. Mahalo nui loa and look forward to seeing you all at a clean-up soon! Hans graduated university with a Masters in Chinese Medicine and has lived in Hawaii for the past 10 years. He is the Founder of Roots & Branches Hawaii - a fully integrated coconut business. Hans climbs and trims coconut trees at over 300 properties on Oahu, chops and sells the coconuts at farmers markets and festivals, and uses all parts of the coconut to produce coconut oil, coconut soaps, coconut cups, bird houses, and bowls, custom fit palm frond hats, palm frond baskets, and to great acclaim, a revitalizing therapeutic coconut skin salve that is in very high demand through the 'coconut wireless'. Hans' dearest passion is sustainable stewardship of the land and community around him. All tree waste and coconut scraps are composted at the farm and bring new vitality to his ever growing food forest. 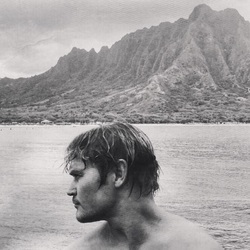 In his free time, Hans enjoys body surfing at Makapu'u on big days, surfing on the North Shore, and long swims to the Mokolua Islands and elsewhere. In his capacity as Ambassador for Waimanalo, Hans will be on the lookout for opportunities to protect, preserve, and even improve what CNN reported as the No. 1 beach in the country for 2015. You can learn more about his coconut business or schedule acupuncture or massages at Roots & Branches Hawaii. Byron graduated from the prestigious Colorado School of Mines with a BS in Mechanical Engineering. He currently lives on the Windward side of Oahu where he works as a Project Engineer at a rapidly growing solar company. In his free time Byron enjoys body surfing, hiking in the Ko'olaus, and swimming on the Windward and North Shores. In his capacity as the Ambassador for the stretch of coastline on the windward side from Kaneohe to Kahuku, Byron will be searching for opportunities to improve the beach parks, keeping an eye out for trouble spots where garbage or other run-off or debris collects, and keeping appraised of social and political developments that will impact that area. As our resident Engineer, Byron will also be instrumental in larger scale sand sifter designs and builds.